Come check out this move in ready home on .6 of an acre in a quiet community. Three bedrooms, 2 full baths, master en-suite, all new flooring in 2014, new sinks and toilets, new paint inside and out, new hot water heater 2 months ago, new backsplash and countertops, and all new windows in 2018 are just some of the benefits of this 1,372 sf home. The detached, oversized. 2.5 car garage has it's own bathroom, and plenty of room for a workshop. Located on a quiet cul-de-sac in East Big Water home has lovely views of the Straight Cliffs Formation. 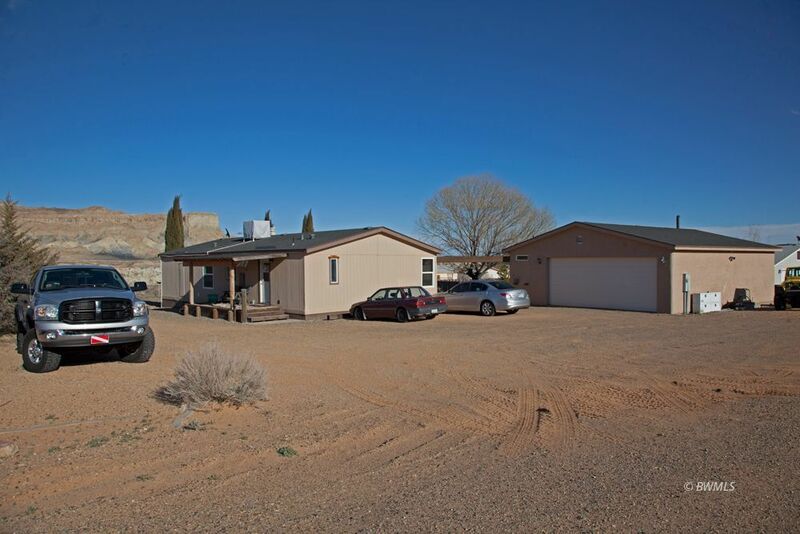 The landscaped yard with irrigation means you can spend more time relaxing and enjoying the easy access to the wide variety of outdoor activities available within a few minutes drive, or better yet, a couple of minute walk to the cliffside of Wahweap Creek, State Trust Lands, BLM land and the National Recreation area. Come see what this home has to offer.